After a quick dunk in vinegar, summer vegetables at the peak of freshness are packed in olive oil with herbs and spices. The condiment keeps in the refrigerator for a few weeks, and is convenient to have on hand to enliven grain- and bean-based dishes. The added bonus is the leftover seasoned oil, which is nice for salad dressings and sautés. 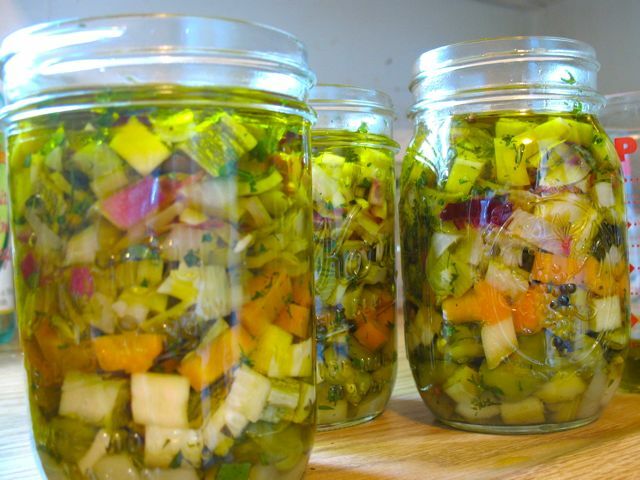 Use these marinated vegetables in place of raw wherever you might want their acidic brightness and enhanced flavor. Try them in a warm lentil salad with soft goat cheese or kielbasa. Or stir some into steaming-hot quinoa with cotija cheese and serve with grilled meats. Always drain the vegetables well before using, so you can control how much of their oil you use. Then simply pour the oil back into the jar over any remaining vegetables. This recipe is inspired by one found in Preserving Food Without Freezing or Canning. Sterilize 2 pint jars by boiling them for 10 minutes. Season the vinegar with 1½ teaspoons salt, and bring to a simmer. Divide the vegetables into 4 batches. Poach the first batch in the simmering vinegar for about 2 minutes. (The vinegar should cover the vegetables.) They are finished when they are still crisp but have absorbed enough vinegar to taste pickled. Scoop them out with a slotted spoon and drain in a colander. Spoon the hot vegetables, distributing them evenly, into the 2 jars. Add 2 coriander seeds, a pinch of salt, and a sprinkle of the chopped herb mixture. Repeat with the remaining 3 batches of vegetables. Allow room in the jars for 2 inches between the rim of the jar and the vegetables. Tap the jars on the counter to settle the vegetables. Pour the olive oil into each jar in a gradual stream, to allow air to escape. (The oil should cover the vegetables by ½ inch.) Leave 1½ inches headspace between the top of the oil and the jar rim. Wipe the jar rims with a clean towel. Make sure no vegetables stick up above the oil. If they do, push them down with a spoon. Seal the jars with lids and bands. Store in the refrigerator for up to two weeks. If you use a partial jar, replace the oil over the remaining vegetables.